Somehow over the course of a month the Cap'n went from being in the majority to the minority with respect to American Hustle. At the time American Hustle was released, the critical consensus was high on the film, audiences were looking forward to seeing it, and things looked good for David O. Russell (I Heart Huckabees, Three Kings)'s follow-up to Silver Linings Playbook. I saw it, really enjoyed it, and wanted to spread that enthusiasm, only to discover that friends of mine who I thought would also dig the movie... didn't. And then the internet backlash started. Now American Hustle is, from what I've been reading an watching, a mess; it's a case of actors doing whatever they want with no clear direction to corral them and a director who clearly doesn't care about the story being told and it's just meh. Totally overrated. Now, if it was just the internet, I could understand that, because if there's something you like, spend five minutes online and you'll find hundreds of people vociferously arguing why it's the "worst thing ever" in forums and comments or on blogs (like this one - I bet someone out there who loves Lockout can't understand why I thought it was the worst movie of 2012). The internet is a place where everybody gets a voice whether anyone wants to hear it or not (Blogorum - case in point), so that's fine, they hate American Hustle. My friends were a bit more puzzling, and it wasn't so much that they hated it, but that they were underwhelmed. Maybe it was expectations for a new David O. Russell film, which usually sets the bar pretty high, or for the cast (which is impressive), but it didn't do it for them. I understand that, because I felt like Silver Linings Playbook was a thoroughly average movie that was nice to watch and amusing but in no way deserving of all the attention it got during Awards Season. In fact, I'd mostly forgotten about Silver Linings Playbook until after I watched American Hustle. So American Hustle still makes the cut in the "Best Of" because while I was watching the film I enjoyed it tremendously, but it's an outlier. It's on the edges, although not because of anything in the first three paragraphs. No, American Hustle gets bumped a bit because of the director and type of movie Russell is paying homage to, and only because the director in question also made a movie this year and it's that much better. Still, I'm going to stick up for American Hustle, because I disagree with much of the criticism thrown its way, and I think the internet is willingly overlooking what a clever, amusing ride the film is. Unlike The Butler or Dallas Buyers Club or Saving Mr. Banks, American Hustle doesn't mess around with the "Inspired By a True Story" schtick we've been seeing a lot of in 2013. It is based on real events, although not strictly speaking, and the title card at the beginning makes it clear that some of the movie really happened. Not all of it, but mostly the catching a politician in a sting operation in New Jersey part. Although it would have been pretty cool if the person who caught him had the terrible comb-over / wig combo that Irving Rosenfeld (Christian Bale) is rocking. American Hustle opens with a long, dialogue-free section while Rosenfeld is putting on his wig and adjusting his hair to make it look real, which it doesn't. It never looks real, and while it's kind of pathetic, it's a visual indicator of the underlying theme of American Hustle: everybody is lying. Coming into the film, I was taking the "hustle" part seriously, and rightfully assuming it meant that the film was a "con artist" movie, so I'm watching it for the con. Everybody in this movie is lying (well, almost everybody, and I'll get to the exceptions shortly) and the fun, for me, was figuring out the angle: who was lying to who about what and when. Rosenfeld is preparing for a sting with Lady Edith Greensly (Amy Adams) and Richie DiMaso (Bradley Cooper), and thanks to some undercover cameras, we know it's 1978. They're already bickering and Irving doesn't trust Richie and somebody's hairpiece gets messed up. I'll let you figure out who that might be. In Goodfellas fashion, we then jump back to Irving's life as a child, helping his father improve business as a window repairman by throwing rocks in strategic directions, if you catch my drift. Irving meets Edith, who isn't actually Lady Edith Greensly, or even British, but in fact is Sydney Prosser, a former burlesque dancer who moved to New York and got a clerical job at Cosmopolitan, but that's not really her calling either. Sydney and Irving bond over Duke Ellington at a party and he gives her free clothes from the laundromat he owns. Also, Irving suggests she joins him in scamming people out of money with fake loans, but Sydney leaves. Irving thinks he screwed up, but she comes back in with a British accent and introduces herself as Lady Edith. Con artists in love. So how does Richie fit into this? Well, he's an FBI agent that busts London Associates during one of their loan scams and decides to cut them both a deal: help him bust four bigger fish in the pond and he'll let them go. Richie immediately has eyes for who he thinks is Lady Edith, despite the fact that he has a fiance who lives with him at his mother's house. Also, he wears curlers at night to give him a perm, of sorts. Oh, did I mention that Irving is already married? Yep, he has a wife, Rosalyn (Jennifer Lawrence) and has adopted her son Danny (Danny and Sonny Corbo), and Sydney knows about this but doesn't really care. Rosalyn knows, and probably cares, but is also kind of crazy and hates it when people tell her what to do. She's a liability, as we'll see later in the film, but Irving loves Danny and doesn't want to lose him, so he sticks with her. So, I mentioned earlier that there are three genuine characters in American Hustle, and one of them is DiMaso's first target: Mayor Carmine Polito (Jeremy Renner). Instead of being a corrupt politician willing to take a crooked deal from a Hispanic FBI Agent posing as an Arab Sheik (Michael Peña), Polito genuinely believes that this investment in Atlantic City casinos will help bring jobs back to the community. And the community already loves him. Moreover, in a moment that confuses Irving, Carmine becomes friends with Rosenfeld, takes him out to dinner with his wife, and gives him a microwave, not as some kickback but as a sincere gift for helping him help the community. Irving thinks it's an angle, but it's not, and the scene is rather touching, because in a world of con men, Rosenfeld never had a real friend. The other genuine characters are DiMaso's supervisor, Stoddard Thorsen (Louis C.K. ), who is stuck between Richie asking for ridiculous things like two million dollars, the entire floor of a hotel, and a jet, and his boss Anthony Amado (Alessandro Nivola), a middle of the chain guy who wants to make a name for himself. Thorsen is just trying to do right by the agency and is repeatedly punished for it, while Richie tries to guess the moral of an ice fishing story that Stoddard never finished telling. The last character, I'll leave as a surprise, but it involves the mob and was really nice to see this actor as imposing again. It's been a long time and gives me hope that we might see more of it in the future. Things naturally spiral out of control because Richie overestimates his ability to con people, to Irving's annoyance, but Lady Edith is also working him over (or is she working over Rosenfeld?). Meanwhile, Rosalyn can't be bothered to follow the instructions not to put metal into the "science oven" and sets something else in the house on fire. It gets messier when Carmine insists that Irving bring Rosalyn, and not Edith, to dinner and then to a party with members of the mob in attendance, and before you know it everybody is in way over their heads. I think I can understand the "actors gone wild" position, even if I don't agree with it. The story isn't meant to be taken on its own terms, because movies about con artists are their own particular beast. Yes, everybody has crazy hair and Amy Adams is using a British accent and only Jeremy Renner and Louis C.K. seem the least bit reserved, but that's because they're playing roles. The three main characters in American Hustle are constantly shifting because they need to convince someone to trust them, so yes there's inconsistency in the performances. I don't think that's simply a case of David O. Russell letting the actors improvise and never reigning them in. Maybe the gaudy 70s clothes and disco music are also helping this argument persist? I'm not sure, but at any rate, I see the performances as part and parcel of the story, not existing in place of one. On the other side, while I enjoyed Jennifer Lawrence's train wreck that is Rosalyn Rosenfeld, she's much too young to be playing that character. It's never more evident than in scenes with Bale and Lawrence together, where he seems to be the right age and she seems even younger than she's playing. On the other hand, the microwave scene is pretty funny. Renner and Louis C.K. underplaying actually helps as a counterbalance to the outlandish Bale and Cooper, and Amy Adams is a force to be reckoned with in this movie. Even as people complain about American Hustle being overrated, the exception is always Adams' performance, with good reason. She's electric in every scene in the movie, and when Sydney comes clean to Richie that Edith doesn't exist, it's a powerful scene for both actors. Does the Goodfellas / Casino multiple-narration, doubling backwards and forwards on itself help American Hustle? 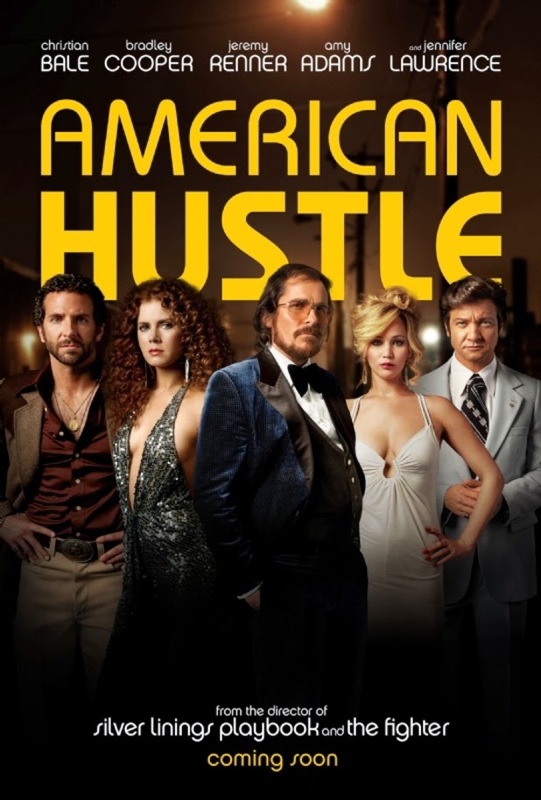 Well, David O. Russell's take on a Martin Scorsese movie definitely isn't going to compare well to an actual Martin Scorsese movie (as we'll see in a little while), but imitation is the sincerest form of flattery, and taken on its own, American Hustle uses the structure well. I think it's probably right that it shouldn't get the kind of Awards Season attention that it's getting already, but considering the backlash directed at Jordan Belfort and The Wolf of Wall Street, American Hustle might be seen as a "safer" alternative for voters. I don't know. I enjoyed every moment of American Hustle while I was watching it, and in retrospect it's maybe slipped down the list a few tics, but that's only because I saw a few movies that I liked more. And we'll be getting to those very soon. Stay tuned.